Made of polished, high carbon, drop forged steel. Broader handles for better leverage and extra comfort; heat treated to hold their edge; cuts up to 4/0 aluminum and 2/0 soft copper. Not for use on steel or ACSR cable. Channellock Blue comfort grips. Made in USA. 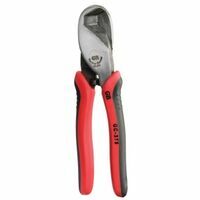 High leverage jaws with shear-cut blades; fits into most tool pouches; non-slip grips. This is not an insulated tool, do not use on energized circuits, wire, cable, cut steel or ACSR. Has 5/8" capacity.